5Forms Business Checks & Forms > Healthcare Products > 5764 Timescan Undated Appointment Sheets 2 Col 10 Min 12 X 11"
Gives you the flexibility you need for scheduling appointments. A perfect appointment binder add-on. Undated sheets allow you to add time when you need it! Quality Construction! Appointment book refill paper made of 30 lb. ledger stock. Size: Looseleaf sheets 12" x 11"
Convenient to use! Printed with days of the week for your convenience. Column Format: Appointment Book refill sheets feature a 2 column format. Your Day In Depth! 10 Minute Interval Spacing. 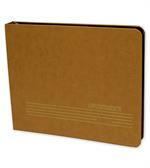 M5601 Timescan Dayscan Flex Binder 12 x 11"
M5766 TimeScan Dayscan Hardcover Binder 12 x 11"
$25.20 5764 Timescan Undated Appointment Sheets 2 Col 10 Min 12 X 11"